Gujarat, the home to Gujarati speaking people is situated at the border of Rajasthan and Maharashtra, is one of the main centre of the Indus Valley Civilization. The folk tradition of Gujarat includes bhavai and raas-garba. The raas-garba is a folk dance done at the celebration of Navratri. The traditional dress worn are Chaniaya Choli worn by the female and Chorno-Kediyu worn by the male. 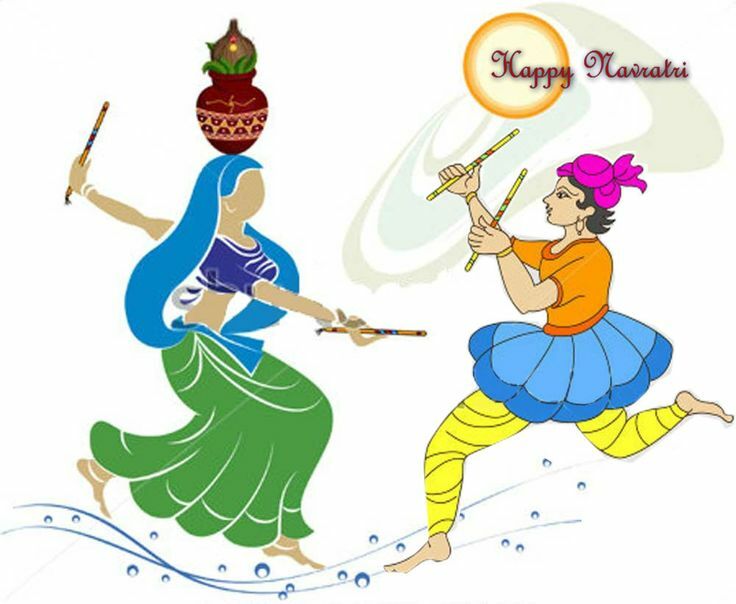 Raas dance is considered to be the form of ras-leela , which Lord Krishna used to perform when he lived the life of a cowherd boy in Gokul and Vrindavan. ‘Kediyu’ or ‘angarakhu’ is the top worn by the male paired with churidar styled bottom known as chorno . The head dress is a turban known as ‘phento’ which is still seen worn by few especially the agriculturists. 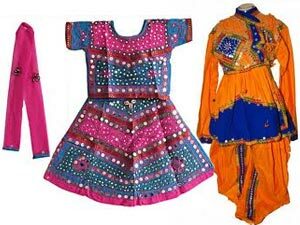 Women commonly put chaniya (petticoat in different colours) embroidered with ‘abhala’- small mirror pieces. The petticoat is paired with embroidery blouse known as choli or polku, along with odhani- a dupatta covering the body and the head . In routine, Gujarati male wear dhoti with a short coat and women wear is sari and blouse. Typical folk dance costumes in men for Raas-Garba is a small coat called Keviya with tight sleeves and pleated frills at the waist with embroidered borders and shoulders ,chudidars and colorfully embroidered caps ,colored turban and colored kamarbandha ( waistbelt) . For women, the dress is lehenga choli or ghahra choli . 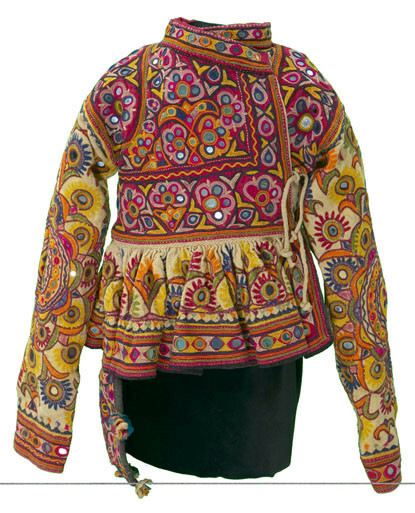 These cholis are brightly embroidered, waist length . Ghaghras or lehengas are ankle length skirts. The attire is completed by a dupatta. Chunky silver jewellery goes perfect with the attire!